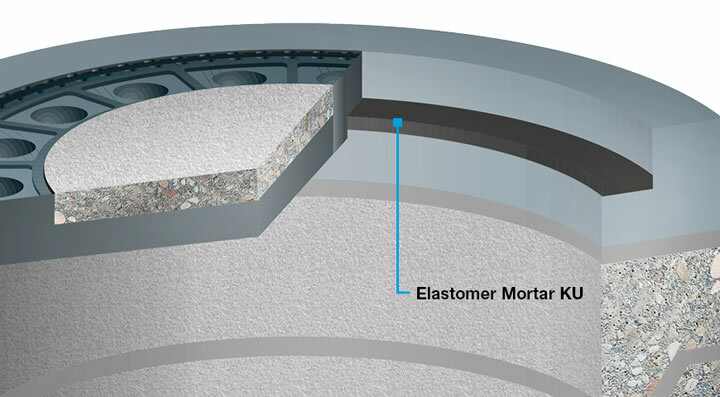 A manually applied, permanently elastic, vibration and noise-damping underlay compound for manhole covers. DENSOLASTIC®-KU consists of a pourable, two-component polyurethane-based system that hardens to become elastic. The pouring compound offers short-term resistance to diesel fuel and is frost and road salt resistant. DENSOLASTIC®-KU has been used successfully in road and railway construction for securing manhole covers or other loose components that are noisy when driven over and that could damage the shaft construction.